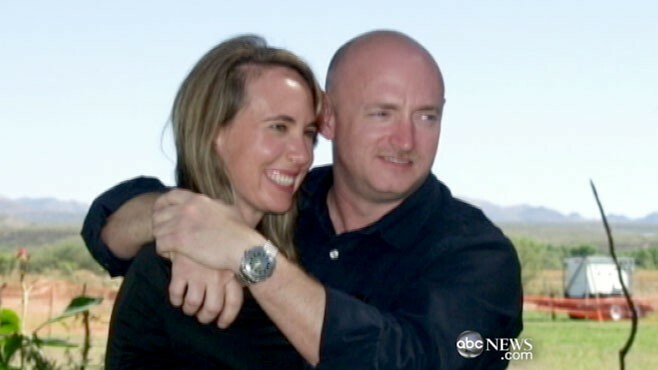 For 20 crushing minutes, Mark Kelly thought that his wife Gabrielle Giffords had died. On board a friend's private plane rushing him and his family to his wife's side, Kelly watched television reports erroneously declare that Giffords had lost her life in the shooting in a Safeway parking lot in Tucson, Ariz., on Saturday, Jan. 8. "The kids ... Claudia and Claire start crying. My mother, you know ... I think she almost screamed. And I just, you know, walked into the bathroom, and you know, broke down," Kelly, an astronaut, told ABC's Diane Sawyer in an exclusive interview. "To hear that she died is just, it's devastating for me." For Kelly, it was the worst moment in a nightmarish day. Calling from the plane, Kelly learned the truth from people who were with Giffords at the hospital -- that his wife had not died, but she was fighting for her life. "It was a terrible mistake," Kelly said about turning on the television. "As bad as it was that she had died, it's equally exciting that she hadn't." Watch Diane Sawyer's exclusive interview with Mark Kelly on a special edition of "20/20," "The Congresswoman and the Astronaut: An American Story of Love and Strength," at 10 p.m. ET. In a remarkably personal interview, Kelly revealed that his wife had spoken about 10 times before the shooting of her fears of being shot during one of her town meetings, and Kelly isn't sure she should continue being a member of Congress after her recovery. Kelly also talks of his wife's remarkable progress and his hope that she'll eventually make a complete recovery. Kelly, who has been photographed beside his wife's bed holding her hand, said there is a habit of hers that has convinced him that she recognizes him. "If I hold her hand, she'll play with my wedding ring. She'll move it up and down my finger. She'll take it off ... she'll put it on her own finger. She'll move it to her thumb. And then she can put it back on my finger," he said. "The reason why I know that that means she recognizes me is because she's done that before. She'll do that if we're sitting in a restaurant. She'll do the same exact movements," he said. Kelly was struck by Giffords' progress again when "she stuck her hand up on the side of my face" and began giving him a neck massage. "She spent 10 minutes rubbing my neck and I keep telling her, 'Gabby, you're in the ICU. You know, you don't need to be doing this,'" he said with a chuckle. Kelly added, "I'm pretty sure she wouldn't do that to somebody else. And she's looking me in the eye." Nevertheless, he is still unsure about the extent of her eventual recovery. "At times I'm 100 percent confident that she's going to make a 100 percent recovery," he told Sawyer. "And, you know, at other times I don't know." Later Kelly said, "She's got a great sense of humor. I've thought about whether that part of her will be the same." Today's emotions and even laughs are a world away from what was going through his mind a little more than a week ago when Kelly was in Houston and got a phone call from one of his wife's staffers telling him his "Gabby" had been shot. He had spoken to his wife just 30 minutes before. "I picked up the phone and she says, 'I don't know how to tell you about this, but I just received a call ... and Gabby's been shot,'" Kelly told Sawyer. "I said, 'Well, that's, you know, that's not possible -- are you sure?'" With no other information, Kelly ended the conversation and hung up his cell phone. He had to look at the phone's call history to make sure he hadn't imagined the news. He told his children -- Giffords' step-daughters -- and then called Giffords' parents and his own. Then, there was one thought in his head. "[I] quickly had to figure out how I'm going to get there very, you know, very fast," Kelly said. By the time Kelly arrived in Tucson's University Hospital, the initial shock had worn off and another emotion had set in -- anger. "I was really angry for two to three days. Very, very angry," Kelly said. "The first call I received after I arrived at the hospital was President Obama, and I expressed to him ... how angry I was." "Whom did you blame?" Sawyer asked. "Initially, I was upset because she'd, you know, received death threats before," Kelly said, adding that he felt it was "just part of what we've been dealing with for the last year." He said they had talked "dozens of times" about how "risky" Giffords' job was. "She says, you know, 'Someday I'm really worried that somebody's going to come up to me at one of these events with a gun,'" Kelly said. Sawyer asked, "Do you still think the climate in this country had anything to do with it?" "I don't. It certainly didn't cause this," Kelly said. "It didn't cause Jared Loughner to, you know, to plan this attack. ... I think you have somebody that's really, really disturbed, possibly schizophrenic." Kelly told Sawyer he has no desire to meet Loughner, but when asked if he would ever be willing to meet with Loughner's parents, he said he was open to the idea. I'd probably see them," he said. "I don't think it's their fault. It's not the parents' fault. I'd like to think I'm a person that's somewhat forgiving. And, I mean, they've got to be hurting in this situation as much as anybody. Still, Kelly believes that there's now a chance to change a political environment he thinks is filled with far too much vitriol. He has seen the anger firsthand, watching during Giffords' campaigns as his wife was called a terrorist, targeted by death threats, and had the front door of her office shot out after a contentious vote. "Maybe we could use this as an opportunity to make things better," Kelly said. "Maybe it's time to just tone it down, try to get back to a better place, try to get to a place where we can just disagree, and get rid of the heated, angry rhetoric." From the moment Kelly and Giffords met on a delegation to China, he knew her to be a hardworking, optimistic person with a true passion for her job. Then she was a young state senator, and he was an astronaut struggling through a divorce. As the two built a friendship, Giffords even offered her eventual husband dating advice before they realized that their future was with each other. Giffords and Kelly knew their relationship would never be a conventional one. Their first date was to a state prison so Giffords could do research on death penalty legislation. "She asked me if I wanted to come, so I decided to come back to Arizona to go do that with her," Kelly said. "That was our first date, visiting death row." With Kelly's demanding NASA job, the couple was lucky to spend 10 days a month together, scheduling in time between his training calendar and her travels between Washington and Arizona. But their emotional bond was strong, sharing their lives through hour-long phone conversations every night they were apart. In the hospital, Kelly is closely monitoring his wife's recovery, tackling every detail with the same focus he brings to his job as a space shuttle commander. In the first days after the attack, he slept in the hospital and only recently has begun to stay in a hotel across the street. Though the couple owns a condo just two miles away from the hospital, Kelly prefers to be as close as possible to his wife's bedside, where he tells her he loves her and reads out loud some of the thousands of supportive letters and emails that have flooded in since the attack. So far, doctors say Giffords' recovery has been nothing short of miraculous. Last Saturday, she was removed from a ventilator, and on Monday her condition was upgraded to serious from critical condition. Doctors have inserted a tracheotomy tube in her throat to help her breathe and put a feeding tube in her stomach. While his wife has yet to speak or hint at how much she understands, Kelly has witnessed Giffords following instructions, like a command to hold up two fingers. "I can hold up a pen and I could say, 'Take the pen.' And she could take the pen," he said. "And then I could say, 'Give me back the pen,' and she'll give it back. It's really good progress." Doctors have been unsure whether Giffords is actually able to see, but Kelly is confident that she's looking at him from her one unbandaged eye. Kelly hopes his wife will make a complete recovery, and so far doctors have ruled nothing out. Always the commander, he's even set goals for her, telling her she'll be up and walking in two weeks. But Kelly knows his wife has a long road ahead, a recovery that will be measured in months and maybe longer. When Giffords does begin to speak, Kelly knows they have plenty to talk about, like having to tell her about the six people who lost their lives in the attack, including 9-year-old Christina-Taylor Green and one of her dedicated staffers, Gabe Zimmerman. Then there's the question of his future and whether Kelly will be the commander of the final space shuttle mission on April 19, known as STS-134. This past weekend, his crew sent a supportive tweet, saying "Gabby is improving. Mark is strong ... STS134 will succeed." Kelly's mission is a significant honor, commanding the final flight of the space shuttle program. He hopes to be able to discuss the matter with his wife before he decides whether to return to space. NASA has sent a colleague to help him in Tucson, and a NASA psychologist has even been providing him counsel in the days since the attack. "I'm hopeful that I will be able to rejoin my crew, finish getting ready for this mission and launch of April 19," he said. "I mean, my first priority is her. You know, she needs me to be by her side." Giffords and Kelly will also have to decide whether she'll resume her work. Sawyer asked, "Do you want her to go back into Congress after this?" "That's a tough, tough decision. Probably not," Kelly said. "But I know that's probably not going to matter to her. I think she's such a devoted public servant that she's going to come out of this and be more resolved to fix things, to make things better for people." Kelly has made sure to keep track of every gift, every message, every act of generosity from the people of Tucson, knowing that his wife will want to handwrite thank you letters. "You know, she has Tombstone, Arizona in her district ... the town that's too tough to die," Kelly told Sawyer. "Gabrielle Giffords is too tough to let this beat her."